Meeting point is at the Ocean Blue Adventures office situated in the Milkwood Centre, Hopwood street, 15 minutes prior to the departure time. 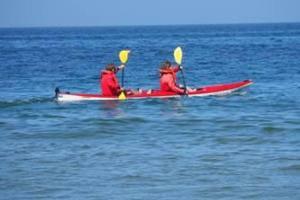 This is an amazing experience and often you will kayak with dolphins right next to you. 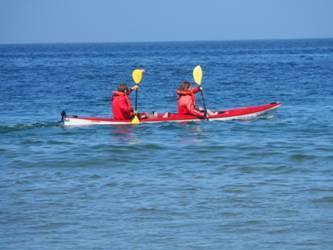 When you reach Robberg Nature Reserve you will kayak amongst the seals at the seal colony. Your guide will introduce you to Robberg Nature Reserve and our wonderful marine life in the bay. In whale season, you will encounter these majestic mammals on your tour. All equipment is provided and beginners are welcome. Central Beach to Robberg Nature Reserve. Guests meet at Ocean Blue Shop 15 minutes before the trip. One guide per 6 x people per trip. Guide to carry radio & all SAMSA Equipment. After trip guests shower at beach. Tea and Coffee facilities at Ocean Blue Adventures. Please bring own towels, hats & sun screen. Everything you wear will get wet, wear swimming clothes.